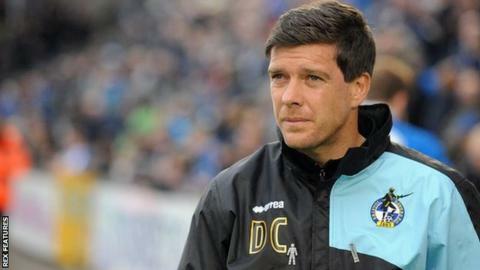 Bristol Rovers manager Darrell Clarke was unhappy with his side's finishing following the 2-1 home defeat by Stevenage in League Two. Chris Whelpdale scored a 60th-minute winner to give Boro boss Teddy Sheringham his first away win. "At the minute we seem to need five or six chances, but the opposition are taking their chances," 37-year-old Clarke told BBC Radio Bristol. "If things are not quite dropping for them, they have to keep working hard." He handed new signing Paris Cowan-Hall a full debut, and the Millwall loanee created Rovers' goal for Matt Taylor. Clarke believes his side, who have now lost eight home games this season, will learn from two consecutive defeats. "It was never going to be a bed of roses this year and this a low - but we will stay strong," he added. "Coming up a division we are going to get a few kicks along the way and people do forget we are new to this league. "It is a group that is learning and people forget that we have actually gone up a division this year."